Accessible from anywhere, on any device. With Clipboard, staff can report incidents the moment they happen wherever they are from their mobile device. Every school has different requirements when it comes to reporting incidents. To make sure you uphold your duty of care in the format used by your school, the Clipboard Incident Reporting form is completely customisable. See a historical view of all the incidents that have occurred at your school. You can also export injuries to Excel or PDF format, allowing you to file the incident or distribute details with others. As soon as an injury is reported, the relevant manager will automatically be notified. 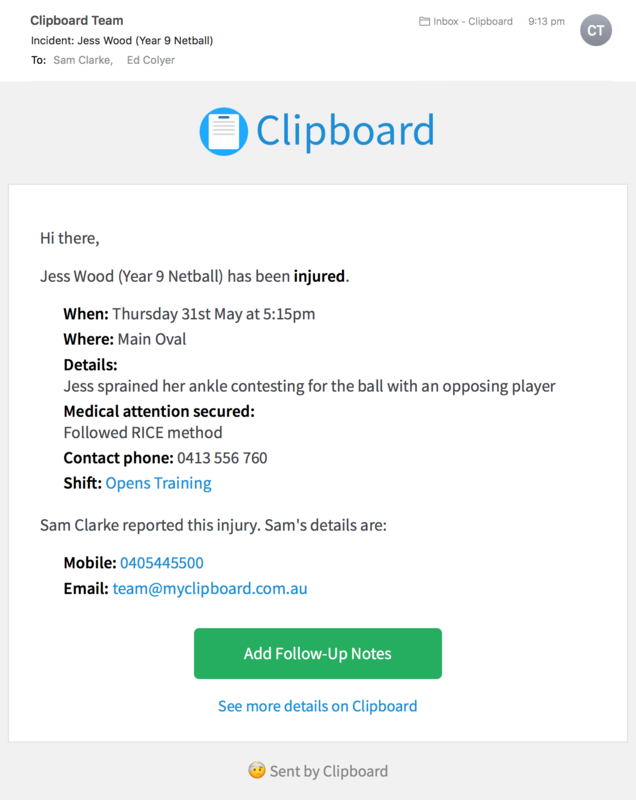 We also allow you to add other ‘Incident Contacts’ to be emailed, such as the Head of Sport, the clinic, or the boarding house. "When an injury happens at training or during a Saturday game, it would often take until Monday morning for the incident report paperwork to make its way back to me. But with Clipboard I get an email as soon as an incident is reported so I’m always in the know and can take the necessary actions immediately."